ATLANTA, Georgia (CNN) -- Samuel Welsh's chances of landing a job before this economic downturn were already slim. Samuel Welsh, laid off since 2006, has found solace in his faith. "You got to keep God in your heart," he said. Now, as a disabled worker, the 29-year-old is competing with thousands of nondisabled job seekers going for jobs once allocated for the disabled population. Welsh was laid off from his job as an executive assistant in 2006. "I did mortgages, refinances and purchase deals. I was dismissed from that job and after that I was sent over to the Bobby Dodd Institute to do my vocational rehab counseling," he said. The Bobby Dodd Institute in Atlanta provides job training and rehabilitation for people with disabilities. Meg Godfrey, an employment specialist with BDI, has been handling Welsh's case. "He came to us originally looking for a position in administrative clerical type work. We have lowered his goals to greeting and ticket-taking, but those are the first jobs that go in this type of economy," she said. As part of her job, Godfrey seeks potential employers who will allocate some of their positions for people with disabilities, but as unemployment has soared, competition has gotten fierce. "Usually, we can get three to five jobs a month. Lately it's been one or no jobs each month. There are some employers I have talked to about hiring our clients. It's in a restaurant-type business and they have people coming in and putting applications that have previously worked at Morgan Stanley," she said. For Welsh, the competition and the wait have proven too long. He recently started a home cake-making business using cooking skills he learned from his grandmother when he was growing up in Alabama. 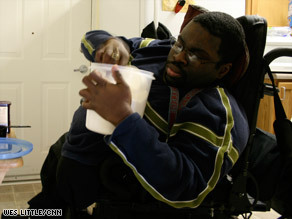 He gets orders from local clients and delivers the cakes with the aid of public transit for the disabled. He gets about three orders a week, at an average price of $15 per cake. Welsh said he evaluated his skills and abilities before starting his business. "I know that I can bake cakes. I know that people like cakes; people like to eat a little something sweet, " he said. He added that he has not lost hope about finding a job. Wayne McMillan, CEO of BDI, says job numbers for people with disabilities show little hope. "It's terrible to be without a job in this country. It's tragic to have a disability and be without a job. We are having people come through the programs that we are not being able to place. Last year we placed 171 folks; during the month of December zero; January two. This is a real crisis for us," McMillan said. For the first time, the Department of Labor in February released a report tracking unemployment rates among disabled job seekers. The survey found a 14 percent unemployment rate among disabled workers -- almost double that of the nondisabled population. And only 21 percent of the available working disabled population is employed, compared with the 65 percent of nondisabled workers. "It is not at the top of most people's minds," said Megan Rutter Branch, director of communication for BDI. "They are seeing family members go off and have the dignity of work, and earn a paycheck, and the only expectation that is had of them is to sit at home, watch TV and stay out of trouble." She emphasized that disabled workers have one of the highest retention rates in the industry, 82 percent to 87 percent, according to BDI figures. "Our folks wouldn't want to leave. They had to overcome all these hurdles to get a job." According to the U.S. Census, people with disabilities comprise the largest minority group, approximately 20 percent of the population. Robin L. Shaffert, senior director of corporate social responsibility with the American Association of People with Disabilities (AAPD), says it is critical for this group to be included in economic recovery plans. "It is very important for our society that we are using all the productive force of our society. It is important that we are also looking at people with disabilities and make sure we are looking for solutions for them as well," Shaffert said. AAPD research shows that President Obama's economic stimulus package has allocated funds to help people with disabilities, such as increased Medicaid help, vocational rehabilitation, help with independent living and specialized education. Until that help comes, Welsh, who suffers from spina bifida, says he is holding onto his faith. "You got to keep God in your heart. As long as you got him in your side everything will go smoothly," he said.